I haven’t been writing much lately. Nothing creative, at least. I have been writing more tweets than usual, and posting more in Facebook groups. Plus there was that one out-of-character Facebook rant for friends and family to enjoy. There have been extensive comments on proposed government policies, and corresponding emails to politicians. And I have some business and media types still on my to-email list. So I guess there have been a lot of words, just not a lot of stories. It’s hard to focus on making things up when so much real life is disappearing. My recent words have been about caribou, coyotes, and cormorants. November, once reserved for the dug-in flurry of fiction writing that is Nanowrimo, has instead been filled with public meetings and private missives sent to friends who I both hope and fear are feeling the same way I am. How do you take time to make art when the world is in ecological crisis? How do you live your normal life? And should you even try? I’m lucky, at least, that my day job at a public garden/conservation area/nature education centre feels like it matters more than ever. So that part’s easy...ish. 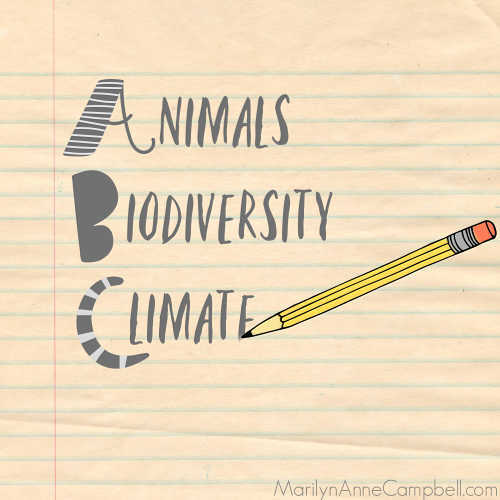 But I find it hard to motivate myself to write anything outside the scope of my new personal ABC’s - Animals, Biodiversity, Climate. And even getting those words out is hard, because the storm of bad news is relentless, and it’s so easy to lose hours and days and weekends just reading and worrying and wondering how best to help and then reading some more, letting time we don’t have slip away. So I will keep writing - the policy comments and the plays, the pamphlets and the poems. Because we need to fight, but we also need more people to love the world. I think that might be our only hope. Hello, welcome (back), thanks for reading. As the title suggests, this post is mainly to keep myself on track. If it connects with something you’ve been thinking or feeling of late, that’s great. But it is not meant to be a statement on how anyone else spends their time. If you are prolifically creating wild, wacky, wonderful things? Amazing. If you have walked away from your regular life to strike on the steps of your nation’s parliament? You are my hero. I suspect my most useful place is between those two, but then, it's a rather baffling time. Beautiful sentiment. Thank you for sharing.